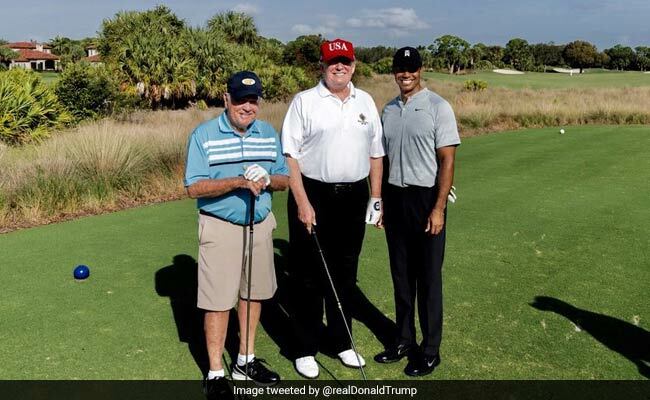 Tiger Woods and 18-time major champion Jack Nicklaus played a round with Donald Trump in Jupiter, Florida, earlier this month. Donald Trump tweeted a picture of himself standing between the two golf legends at the Golf Club. Tiger Woods said Wednesday he had a 'great time' playing golf with President Donald Trump and Jack Nicklaus this month while deftly declining to discuss the state of the commander in chief's game. "I've had a bit of an opportunity to play with a couple of presidents in a few weeks and enjoyed both days," said Woods, nothing that he teed it up with former President Barack Obama before the Farmers Insurance Open at Torrey Pines in January. Woods, talking to reporters on the eve of the US PGA Tour's Genesis Open, was asked to analzye Trump's game, but didn't go into details. "President Trump has been very busy up in DC, hasn't played a lot of golf -- hasn't had the tan that (comes from) playing in the outside," Woods said. "He's been working. "We just had a great time," Woods added. "I hadn't played with Jack in a very long time. "I played well that day, I shot 64 so I enjoyed the way I played. It was a great day to be able to play with our president and play with one of my idols that helped inspire me to play the game."